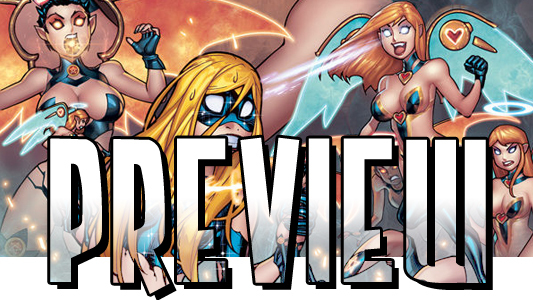 Adam Warren’s Empowered is a great series full of action and comedy, about a superhero called Empowered who is just trying to make it in a crazy world. She has to deal with villains who want to tie her up and heroes who just straight-up hate her. Generally, Empowered is published in graphic novel format, but every once in a while, Warren treats his readers to smaller size special issues, which is what we’ll get with Empowered Special #3: Hell Bent or Heaven Sent. In this issue, Empowered takes a trip to a top secret dumping ground for super-tech and has to fight her way through an army of “cyberangels” and “devil mecha.” Check out our exclusive 8-page image gallery from the issue here after the jump.